Hello there and welcome to another Clearly Besotted Challenge. The theme this month is Halloween or Autumn. For my project this month I went with the Halloween theme and made a little treat bag. I tend to make these most years and I think it is a cute little way to give sweets. My treat bag was cut using the Cricut Explore using one of the designs from the bags, tags, boxes & more collection. I cut it on some lovely Bazzill cardstock which has spider webs glazed on it (but is now sadly retired). I then went to work decorating it. 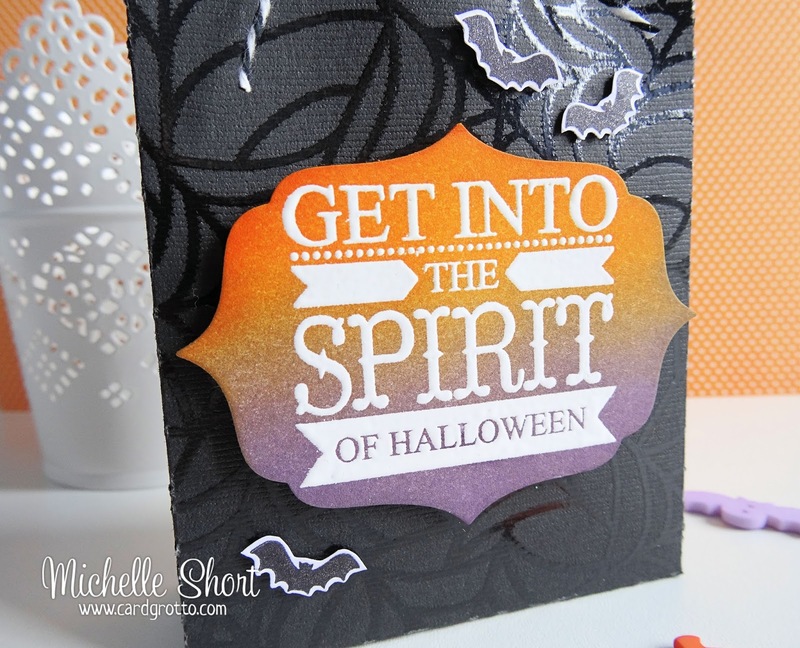 I used the new Halloween Spirit stamp set and stamped the sentiment using VersaMark ink and then heat embossed in white. I then took one of the dies from the Lovely labels die collection and cut it out and added some TH Distress Inks in Spiced Marmalade and Dusty Concord to it. The label has been added to the bag with black foam tape. I then took the little bat image from the set, stamped it three times and fussy cut out. These have had a little coating of clear WOS before being adhered to the bag with more foam tape. To finish it off I added a little twine through the handles. The challenge win run for 2 weeks and a randomly selected entry will win a £30 Clearly Besotted e-gift card. For the full details on the challenge, including how to enter please visit Stephanie's blog. There you will also see the amazing creations by the rest of the DT too. Thanks so much for visiting me today! Super awesome bag! Love the colors together!! What a super and fun treat bag Michelle! Shame about that Bazzill CS. Still, I reckon a spider web stamp and some EP should make a decent alternative eh! *wink*. Oh, what an awesome goodie bag, Michelle! 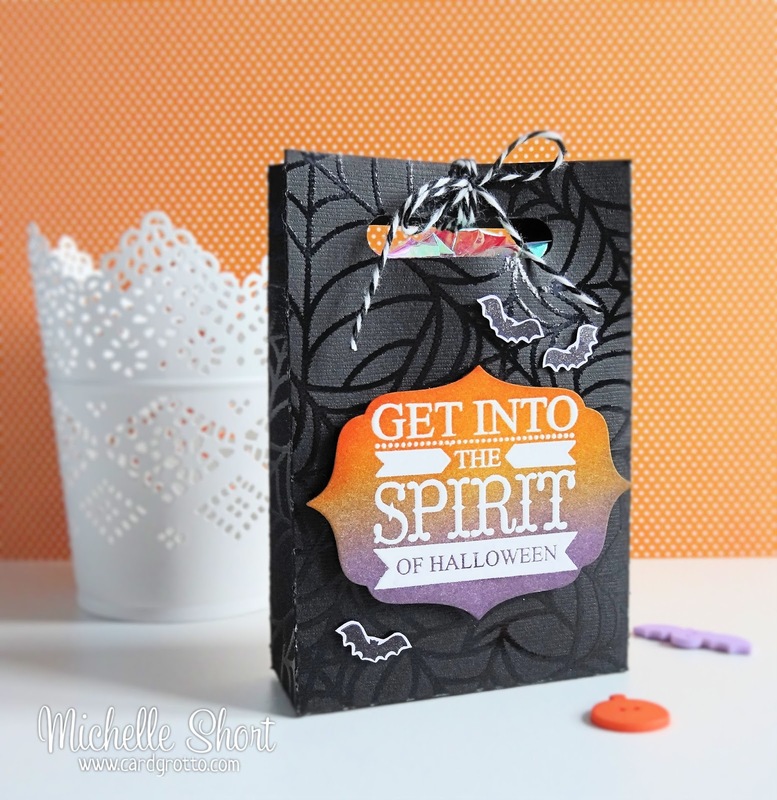 I love how you inked/blended your inks on the tag, and your spider web is amazing!! !